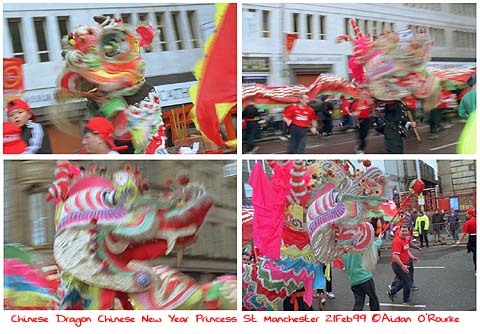 THE YEAR OF THE RABBIT arrived in Manchester on Sunday in the shape of Europe's longest Chinese dragon, which snaked its way from the Town Hall along Princess Street to a thronged Chinatown. Reflecting Manchester's multi-ethnic make-up, the people underneath the dragon were a mixture of white and black, with some Chinese thrown in for good measure. Next to the Chinese Arch, there were traditional Chinese entertainments, along with stalls offering foods from hamburgers and hot dogs to fried rice, noodles and chicken wings. I was expecting a long procession with floats, but this year, the dragon was the sole attraction. But there are big plans for the Chinese festival in the year 2000. NEW CATHEDRAL STREET will soon be open - for pedestrians - not for traffic. Sir Alan Cockshaw, chairman of Manchester Millennium Ltd "topped out" a podium marking the launch of the new street, which links St Ann's Square with the Shambles, currently being rebuilt next to the Cathedral. The hideous concrete slab known as "Shambles West" will soon be demolished and a new development will be put up in its place. Few people remember that on this site used to stand the triangular Victoria Buildings, a magnificent Victorian shopping, office and hotel complex similar to, but bigger than the Corn Exchange. Sadly it was destroyed in the Blitz. I know I'll get my knuckes rapped, but I think some of Manchester's lost buildings should be rebuilt - They've done it in Germany, why not here? A WATERWAYS FESTIVAL FOR THE YEAR 2000 has been given £300,000 of government funding. 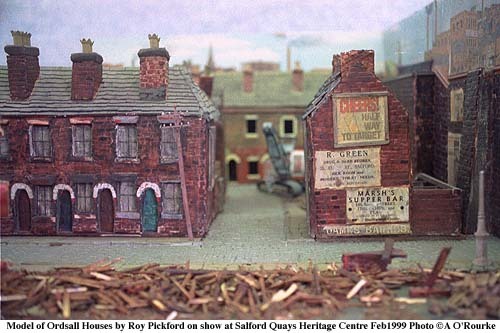 The festivities will take place on waterways across Greater Manchester, including the magnificent Salford Quays. But on a more disappointing note, funding has been turned down for the "Streets Ahead" festival, which will still take place, but on a smaller scale. A SHOPPING DEVELOPMENT is to be built next to the Lowry arts complex in Salford Quays. The Lowry Galleria will be a "designer outlet", where famous fashion names including Next and Jaeger will offer discounts on end of line stock. There will be cafe bars and restaurants in the plush new £70m building, an artists impression of which appeared in Thursday's MEN. What would LS Lowry himself think? I'll be asking this question soon - watch these pages. FAMILIAR LOCAL PLACES can be seen on national tv at the moment in various programmes - City Central is back on BBC1 this coming Saturday night at 9.05, with more police action in downtown Manchester. On Thursday, on BBC2 at 8pm "Fred Dibnah's Industrial Age" goes on an exploration of the past, on Tuesday, the Manchester Bolton Bury canal was featured (curses, I missed it!). There's a website on bbc.co.uk. 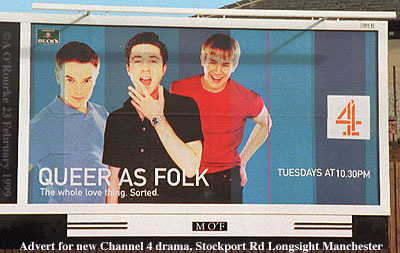 "Queer as Folk" (see billboard ad right) which started this evening on Channel 4, might suggest something in a similar vein, but in fact it's a hard-hitting contemporary drama about three gay men set in Manchester's Gay Village. By contrast, a programme your granny and grandchild would be very happy to watch is "Mrs Merton and Malcolm", a cosy domestic drama in which the bespectacled blue-rinsed mum dotes on her little boy Malcolm - who celebrated his 37th birthday this week. Set in sleepy Heaton Norris in the present, it feels more like a bygone childhood world, right down to the homely red-brick terrace, the blue sky and the bags of sherbet lemons and iced gems. Watch this, expats, and you'll want to come home! CONTROVERSIAL NOVELIST, and former schoolmate of mine Tim Willocks appeared at Waterstones bookshop, Deansgate, on Wednesday night for a reading from Manchester Stories, part 2 (I wasn't there). Red-haired Tim has made quite a few TV appearances and was reported to have had an affair with Madonna. He features on the front page of the current "City Life" magazine. I remember him as having a shock of red curly hair, as being quite witty, with a strong Stalybridge accent, and usually surrounded his group of acolytes. An even more controversial ex-Xaverian person is stage hypnotist Andrew Newton, who was in the same A Level music class as me. Perhaps the most famous literary old boy from my school was Anthony Burgess, author of A Clockwork Orange and other novels. Why is it that Xaverian seemed to turn out these free-thinking creative types? Maybe frustration, as our only contact with girls was on the upper deck of the 53 bus on the way home. 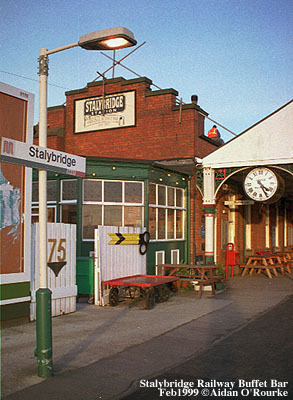 STALYBRIDGE RAILWAY BUFFET BAR has won an award in a competition held by the Campaign for Real Ale and English Heritage. 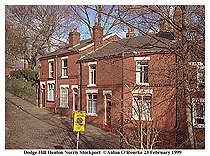 It was singled out for its sympathetic restoration and expansion of the existing bar, which was threatened with closure. I was there a couple of weeks ago - though well known in Real Ale circles, I decided to stick to tea, as I was driving - very nice, complemented with a free ginger biscuit. The old pictures and notices, fireplace and ambience are unique. I can definitely recommend the place! BILL ROACHE alias Ken Barlow in Coronation St is facing financial ruin due to legal bills. It all started when he took "The Sun" newspaper to court after they said he was "boring" and was hated by his colleagues. Though he won the case, his five figure legal costs weren't covered. He says he thinks the matter can be "resolved to everyone's satisfaction". The 66 year old who I believe is the third longest running member of the "Street" cast, says he has no plans to retire, and feels like a young man just starting out. I hope I still feel like that when I'm his age, and older! HOLLYWOOD FILMMAKER GARY KURTZ is to shoot a new film in Moss Side - it's based on the autobiography of Stephen Smith, entitled "Addict". Stephen rose from drug addiction and life on the streets to become a successful businessman. Kurtz says some of the profits will go to homeless support groups. ROBBIE WILLIAMS WAS THE MAN OF THE MOMENT when he won best male solo artist, best British single and best video at the Brit Awards on Tuesday night last week. The 25 year old from Stoke-on-Trent split from Manchester boy band Take That four years ago, and despite dire predictions (including mine) has gone on to huge success. I wonder what his former Take That colleague Gary Barlow thinks of it all. MANCHESTER UNITED NOW HAVE THEIR OWN HOTEL - The superclub have invested £1.2m in the brand new four star Quality Hotel, situated between Trafford Wharf and the MUFC ground. TV chef Gary Rhodes was at the opening on Tuesday of last week. THERE HAVE BEEN A FEW aviation scare stories involving planes landing or departing from Manchester Airport. A British Airways Boeing 767 had to divert to the Azores on Sunday after the captain had to shut down one of its engines. An Irish-registered Trans Aer Airbus A300 was found to have had a string of technical difficulties prior to an emergency landing due to problems with its undercariage. There was a near-miss over the North Sea involving a plane which had departed from Manchester, and a Brymon Airways plane carrying passengers from Manchester came too close to a mast near Aberdeen. Let's hope these incidents serve to further increase air safety rather than passenger anxiety. Be assured that Manchester is one of the best equipped airports in the world, and flying is the safest form of transport. MANCHESTER IS ALREADY GEARING UP for Irish week - an Irish Festival radio station has already gone on air - based at one of the committee rooms in the Town Hall. 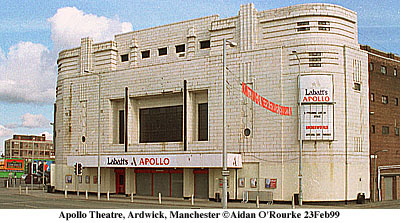 Also, Daniel O'Donnel gave a three hour concert at the Manchester Apollo - No, I wasn't there either! TAMESIDE DOCTOR HAROLD SHIPMAN made national headlines again this week - he is now charged with murdering seven more women patients - making a total of 15 so far. His trial starts in October. A MANCHESTER SUPPLY TEACHER WAS CLEARED of assaulting three boys, but said: "I'm quitting the profession - I can never trust a child again". Howard Bambridge was actually a model teacher, but when three boys accused him of assaulting them during an assignment at Victoria Avenue Primary, Blackley, he was suspended for a year and was effectively "guilty until proved innocent". After a year of anguish and financial difficulties, the three counts of common assault were thrown out at Manchester magistrates court on Friday. 95% of respondents to an MEN poll said teachers were too vulnerable to false accusations. On a brighter note, two local primary schools scored top marks in government league tables. St Michael's Bamford CE, Rochdale, and St Philip's RC Stockport were among only 27 in the whole country which achieved full marks in the core subjects of English, maths and science. GM ARE THE LETTERS ON EVERYONE'S LIPS at the moment, and they don't stand for Greater Manchester (or General Motors). Genetically Modified foods are OK according to the Government, but many disagree. Wigan, Salford, Tameside, Bolton Bury and Stockport local authorities have banned GM foods in their schools. 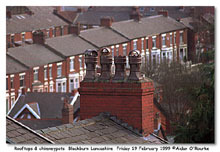 In the City of Manchester, the policy is under review. The topic is being hotly debated, but I won't add to it here. A MISCHIEVOUS SIX YEAR OLD found fame in a photo on last Monday's MEN front page, when he poked his head around the shoulder of the Right Honourable Michael Meacher MP, who was on a visit to a school in Chadderton, and stuck his tongue out for the camera. In Tuesday's MEN, cheeky young Aquaab Ur Rahim was pictured again, this time on page 2, again sticking his tongue out. But P Briggs of Davyhulme, whose letter appeared in Saturday's Postbag, thought the adulation was misplaced: "A resounding clip around the ear would have been more appropriate for this young man's disgusting behaviour. Is it any wonder there is no such thing as discipline in this country today?" IT WAS BITTERLY COLD on Sunday for the Chinese festival, with strong winds and alternate sunny spells and rain. Yesterday was bright but cold, with snow on high ground, and today was gloriously sunny in the morning, and cloudy in the afternoon. 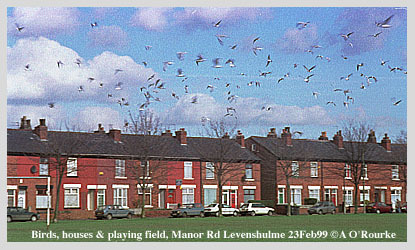 I've noticed quite a few birds settling on waterlogged ground, including those in the picture above, taken in Levenshulme today. The current EWM temperature is 2.4 celsius, 36.3 fahrenheit. 50 NEW PHOTOS ONLINE, well, including those which appeared in last week's Newsletter. I have two new thumbnail index pages, with photos for you to browse, including a few from Lancaster, Blackburn (below) and Warrington. Please have a look at my online exhibition, and remember, many of the photos were taken TODAY - the only way I could make it more up to date would be to go round with a camera, laptop and modem, and upload them as I take them (that will come soon!). Go to thumbnail index pages 750 to 774 and 775-799. This latest update brings the total number of images in the collection to 800! 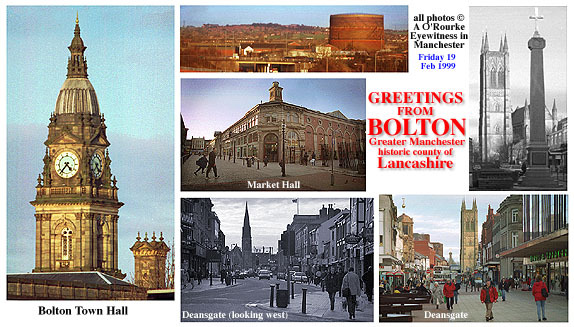 Also, do have a look at the Manchester Civic Society website - there's lots of very interesting stuff about Manchester, and more photos.